There may not have been many new printer announcements at PMA 2008, but that certainly didn’t affect the paper vendors from going all out with new releases. And, it’s clear that old is in as many of the surfaces shown mimic those of traditional darkroom days. If you’re a lover of fiber based papers, this is a great year for you with plenty of new options to explore. The two main trends are to a fiber pearl surface, and baryta papers. If you’re not familiar with the term baryta, it’s a paper that contains barium sulphate in the coating to enhance gloss and give a higher dmax with crisp image definition. It seems to be all the rage these days, and one of the major advantages is the ability to use photo black pigment inks. Stay tuned for future reports where you’ll be able to read more about these papers in actual use. Hahnemuhle is possibly the oldest company in the market, but they’re the first ones taking a “green” step with their new Bamboo, a 290gsm natural (no brighteners) paper that feels similar to a photo rag. It has a warm tone and very smooth surface. Being made from bamboo, it’s considered a renewable resource and therefore has less impact on the environment. 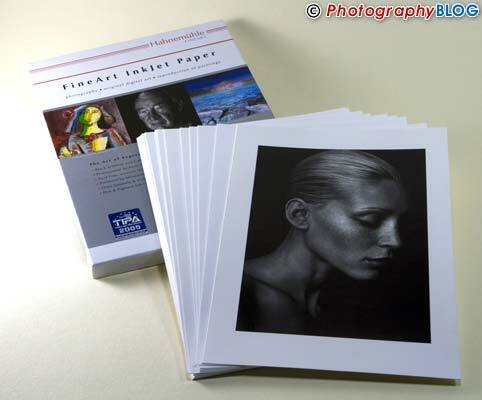 Also new at PMA was the release of the FineArt Baryta 325gsm paper. It’s a 100% alpha cellulose very smooth textured paper that Hahnemuhle calls glossy. Personally, it’s more of a low gloss finish, but however you view it, the results are excellent. I’m looking forward to working with this paper in the coming months. Along with the new Bamboo and Baryta papers, Photo Rag Pearl 320gsm, a pearl finish cotton rag paper with no brightners is now widely available. This paper works nicely with both black and white as well as warm tone color prints thanks to the natural white color and pearl finish. Ilford is also on the baryta bandwagon. 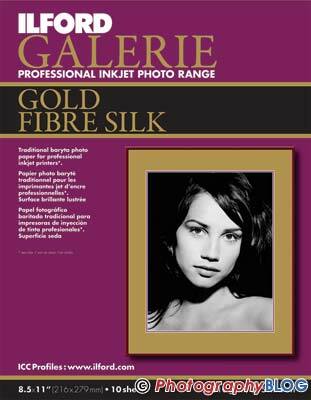 Ilford Galerie Gold Fibre Silk, is the only paper I’ve found that passes the smell test – sniffing this media immediately puts you back into the darkroom. Of course, we don’t buy or use paper because of the way it smells (unless you’re into scratch-n-sniff photography), but there is something reassuring about such a familiar odor. The real test is in how it prints though. Ilford claims the highest dmax of any paper of this type which will make for some interesting comparisons. I’ve done a few test prints with the media and so far I’d say they aren’t exaggerating – it’s a slightly warm toned paper with a beautifully smooth surface that just seems to draw the eye into the print. At 310gsm, it’s a bit lighter than some of the other papers which helps with feeding on printers that might otherwise leave roller marks. Ilford is going the extra distance as well by including information in the package on settings to use if you’re interested in producing toned prints – and at the cost of most of these fine art papers, anything that helps get the desired result in the first print is a good thing! Inkpress has a wide variety of papers and specialty medias – everything from adhesive vinyls and backlit films, to canvas, photo rag, and traditional photo papers. To that mix, you can now add their new Fine Grain Baryta. Similar in weight and texture to the other baryta papers available, the Fine Grain Baryta has a glossier surface than the Ilford or Hahnemuhle offerings and works well with both color and black and white images. Inkpress has been very aggressive in their pricing so this should be a quality paper option at a lower price point than many of the other baryta papers. 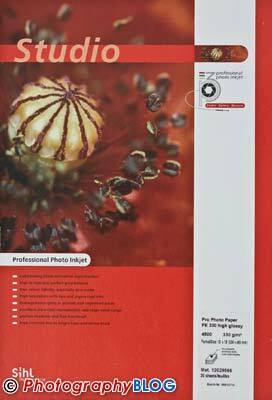 Along with the new baryta surface, Inkpress is now distributing Sihl papers. Available in both 300gsm Silky and 330gsm Glossy finishes, these are premium papers that print beautifully in a variety of printers. Currently, the Silky is my favorite satin finish paper for final prints. Innova is a premium brand that is very popular with the fine art printing crowd. Their FibaPrint Gloss and FibaPrint Ultra Smooth Gloss fiber based papers have an excellent reputation for quality printing with outstanding dmax and weight. I like that it’s available in both white and warmtone gloss as well as a white ultra gloss – I tend to prefer cooler toned papers. Their new paper is a FibaPrint Semi-Glazed and FibaPrint Super Glazed. These new baryta papers have an ultra glossy surface with a glazed finish that should be interesting to experiment with. 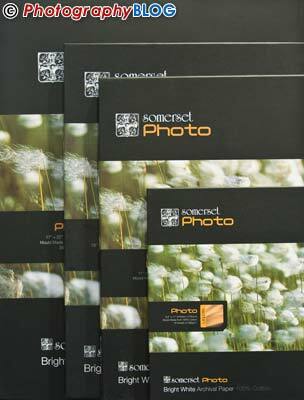 Also introduced were three new canvas products – Photo Glossy, Photo Matte, and Fine Art Matte. All are pre-coated with a microporous gloss coating to enhance color gamut and dmax, as well as eliminate the need to varnish the canvas after printing. Moab, now part of Legion, has a great lineup of papers now. The newer Lasal and Colorado Fiber papers, reviewed in the April issue of Shutterbug are excellent options for a variety of prints. New papers are going in the fine art direction with some conventional, and not so conventional options. First up, the new Somerset Photo Satin 300 is a 100% cotton with “virtually no oba’s” in the paper. Still, it’s a bright white with a very nice surface and reproduces both color and black and white very nicely. On the not so traditional side, three Japanese Washi papers are now available. All three papers are made in Japan from mulberry. Kozo 110 has a slightly textured surface in a natural warm tone. Unryu 55 is a very highly textured paper with fibers running wild on the surface. Finally, Bizan 300 is an individually hand made paper with natural deckled edges and sun dried. This one isn’t cheap - $15.77 per A4 sheet. Pictorico is making a big push with the new Gekko line of papers. Four different surfaces are available, each tuned for a different printing need. Gekko Blue is a traditional pearl finish paper optimized for a standard silver halide look and feel. 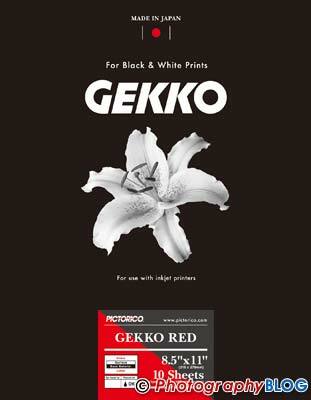 Gekko Red is a warm tone cotton paper with a glossy finish. Gekko Green is Pictorico’s baryta offering, while Gekko Black is a matte surface optimized for gray scale printing. They company also has a new PictoricoPro line with both Hi-Gloss White Film, a very glossy plastic like paper using a polyester film base, and Hi-Gloss Photo Paper, a more traditional RC paper base with high gloss and very white surface. Canvas is getting to be very popular as a print medium for inkjets these days with several new products at PMA showing good possibilities. The first of these is BF Inkjet Media with their TruPalette Grand Photographer line-up. The PC-12.2 Ultra D-Max Canvas is optimized for dmax and is the first canvas I’ve seen that does top quality black and white prints. If you’re into black and white, and looking for a different way to print, you need to check this one out. Premier Imaging Products has a new coating for canvas prints that adds texture and gives your images more of a painted look. It’s not something that I can see myself using, but if you’re into the painted still photo manipulations, this is a good way to set your images apart from the others. Finally, InteliCoat had a variety of Torino canvas products sold under the Magiclee brand, and they announced the acquisition of Crane Museo Fine Art papers. The Museo and Silver Rag lines will continue as before, but will also be available in 60” widths now.